Buy a length or square of thick green baize, the very best surface for cardplay. Made in England from 95% Merino wool and 5% nylon, genuine baize is durable and hardwearing – making this baize ideal for snooker and pool billiard tables. Baize also provides the optimum friction when playing card games. Green baize is also used extensively by professional furniture restorers and upholsterers for all sorts of projects including drawer lining, lining wooden boxes and trays, covering instrument cases, recovering antique card tables, covering church doors, relining gun cases etc. We sell this fabric in two ways: in pre-cut squares or by the metre. The pre-cut squares are ideal for recovering card tables. 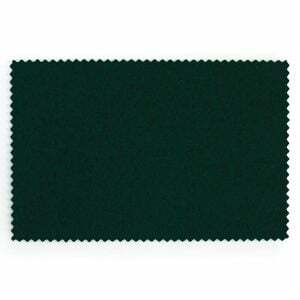 If you need a larger piece, we also supply green baize fabric by the metre. When you buy more than 1 metre, we’ll send a continuous length. The pre-cut square are available in 81cm (32 inches) and 86cm (34 inches). If you choose to buy a metre, the usable fabric width is a very generous 190cm (if you need wider, look at our range of Extra Wide baizes). Either way, the weight of the fabric is 570gsm (grams per square metre). Really pleased with the quality and the colour. The green fitted perfectly on the table (nice and thin). Have yet to put burgandy on my own card table. Once again, many thanks to you and your very helpful staff! Superb, woolen, heavyweight baize cloth with nap on both sides so appears to be reversible. Not cheap but a quality item perfect for gaming table surfaces. Very good Quality My card table looks fantastic.